Since it opened in 2003 Hadrian's Wall Path has become one of Britain's most popular long-distance paths. 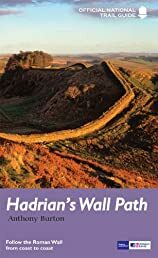 Its 84 miles are a convenient week's walking, shadowing for the most part the historic line of Hadrian's Wall in its spectacular progress across the superbly wild landscape of the north of England. Starting in what used to be Tyneside's shipbuilding heart, and joining Newcastle in the east with Carlisle in the west, it takes you via the extraordinary Roman forts of Vindolanda and Housesteads, close to handsome towns like Hexham and Corbridge, to finish on the lonely shores of the Solway Firth with views of Scotland. This is the official guide to this superb National Trail, published in conjunction with Natural England which administers the path and waymarks it with its familiar acorn signs. Comprehensive and engrossing, it is the only companion you need.